Placing women’s experiences in the context of the major social, economic and cultural shifts that accompanied the industrial and commercial transformations of this period, Hannah Barker and Elaine Chalus paint a fascinating picture of the change, revolution, and continuity that were encountered by women of this time. A thorough and well-balanced selection of individual chapters by leading field experts and dynamic new scholars, combine original research with a discussion of current secondary literature, and the contributors examine areas as diverse as the Enlightenment, politics, religion, education, sexuality, family, work, poverty, and consumption. The authors most importantly realise that female historical experience is not generic, and that it can be significantly affected by factors such as social status, location, age, race and religion. Providing a captivating overview of women and their lives, this book is an essential purchase for the study of women’s history, and, providing delightful little gems of knowledge and insight, it will also appeal to any reader with an interest in this fascinating topic. Here for the first time is a comprehensive history of the women of Britain during a period of dramatic change. Placing women's experiences in the context of these major social, economic and cultural shifts that accompanied the industrial and commercial transformations, Hannah Barker and Elaine Chalus paint a fascinating picture of the change, revolution, and continuity that were encountered by women of this time. A thorough and well-balanced selection of individual chapters by leading field experts and dynamic new scholars, combine original research with a discussion of current secondary literature, and the contributors examine areas as diverse as enlightenment, politics, religion, education, sexuality, family, work, poverty, and consumption. The authors most importantly realise that female historical experience is not generic, and that it can be significantly affected by factors such as social status, location, age, race and religion. 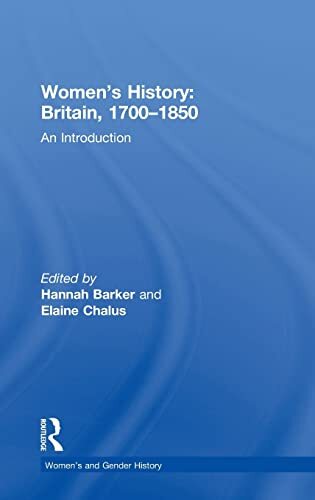 Providing a captivating overview of women and their lives, this book is an essential purchase for the study of women's history, and, providing delightful little gems of knowledge and insight, it will also appeal to any reader with an interest in this fascinating topic.